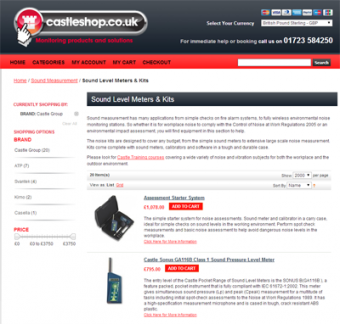 The Castleshop.co.uk is proving a big hit with businesses looking for specialist equipment. Focussing mainly on measurement and monitoring instrumentation, the shop offers everything from Anemometers to Borescopes to Calibration equipment, not to mention the XY& Z of Vibration Meters. The concept for the shop from Castle is not just to list a range of products for sale, but to provide help and assistance wherever possible. Most of the products have videos with them to give guidance on the choice of items and there are links to helpful documents. Castle staff are also on-hand with technical telephone support should you need to sort out your Leq from your Lux levels! The website is broken down into measurement area categories, which are simple to navigate and are sub-divided to keep the choices simple. There is also a smooth checkout system that will take multiple payment methods as well as multiple currencies for international customers – or even people with some euro’s left from their holiday! Interesting products to be found on the shop include a video borescope with a detachable, Bluetooth screen, a pair of ‘Milan’ high fashion safety glasses and an EMF tester for workplace electromagnetic exposure assessments. Visit www.castleshop.co.uk and Contact Us here to speak to Simon Bull.